From Papa's stiff brush cut...to Kiki's bushy cap,like fur ...to Nenny's slippedry locks, here's a family with all different kinds of hair . And then there's Mama, whose hair smells sweet like bread.Mama's hair is like no one else's. \Sandra Cisneros was born in Chicago in 1954. Internationally acclaimed for her poetry and fiction, she has been the recipient of numerous awards, including the Lannan Literary Award and the American Book Award, and of fellowships from the National Endowment for the Arts and the MacArthur Foundation. 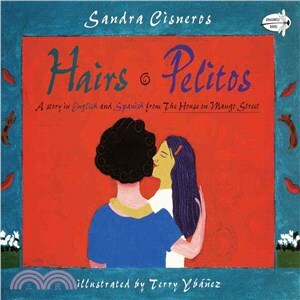 Cisneros is the author of the novels The House on Mango Street and Caramelo, a collection of short stories Woman Hollering Creek, a book of poetry Loose Woman, and a children's book Hairs/Pelitos. She lives in San Antonio, Texas.